Soon after the very first iPhone was released, Apple unveiled the iPod touch media player, which was more or less an iPhone without the phone part. Eventually, Samsung decided to venture into the realm of "smart" media players with Android-based offerings of its own, such as the Samsung Galaxy S WiFi 4.2. And do you know which company might be next to hop on the bandwagon? Well, if a recently discovered patent is to be believed, HTC might be working on a portable media player of its own as we write these lines. Details are pretty scarce at the moment, which leaves plenty of space for speculations to start piling up. Obviously, the unit that is being described in the patent has a huge screen and lacks buttons, meaning that we are definitely looking at a touchscreen-operated media player. Also, chances are that the device will run a flavor of Android, if it ever gets to see the light of day, that is. 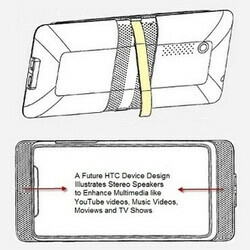 Interestingly, this rumored HTC media player has a kickstand and what appears to be a quartet of speakers - two in the front and two in the back, although the patent does not specify whether these are speakers indeed or just decorative elements. 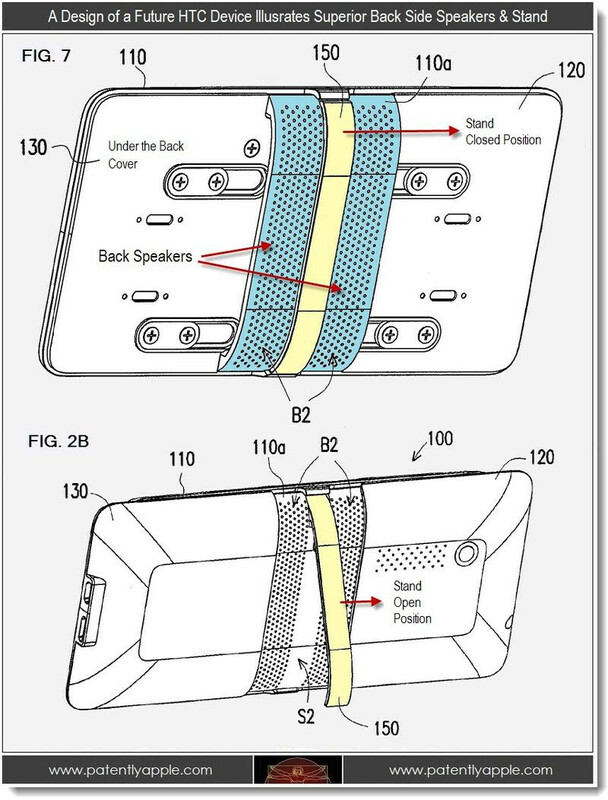 Further examination of the images shows that a camera is present on the device's back, a volume rocker is located on its side, and a pair of ports resides on its bottom side, most likely for microUSB connectivity and HDMI output. Last but not least, we notice something on the unit's front side that resembles an earpiece, suggesting that the device might be able to make VoIP calls. But as the case is with many patents that we come across, there is no guarantee that this rumored HTC media player will ever hit the market, so don't get too excited about it yet. On the other hand, don't you think that such a device might be a worthy competitor to the iPod touch, especially when flavored with a dash of Beats Audio and paired with a great audio streaming service? Let us know what you think by dropping a comment below. me no buyyyy. me galaxy playerrrr. The fact that HTC offers Beats may make this popular. You know that beats audio is pure software tweak and can be ported to other android devices as well? The fact that the galaxy series players have a state of the art dedicated DAC(which can be tweaked even more with something like PowerAMP player) makes it even cooler. That would require certain people to actually understand more about the Android OS, which they probably won't if they're interested in a portable media player. Beats Audio is also great for marketing the device...because it's Beats Audio. I see a Beats branded media player in HTC's future.... Question for the day is.... Do stand alone players still sell? The first, and long-forgotten, stand-alone media-player/internet-tablet: The Nokia 770! ... then followed by the Nokia 800, the Nokia 810, and the Nokia 810 WiMAX Edition... Yeah... then the iPod Touch kind of changed that whole game, too, but still... Nokia was first. Long gone now, but first... Now we have the iPod Touch (in whatever "umpteenth generation" it's in these days...), the Samsung Galaxy S WiFi 4.2, and we are soon to have this, too? I will denfinitely buy this! Now I'm using galaxy player, but it's really bad. I recommend everyone not to buy galaxy player! no true soundalive. It's a sounddead! WOULD BUY THIS IN A HEART BEAT! kick stand stereo speakers HECK YEAH! !